A 1,800 year old bathing pool that was probably part of a 2nd or 3rd century CE bathhouse used by soldiers of the Tenth Roman Legion was exposed in a salvage excavation by the Israel Antiquities Authority and announced today. The discovery suggests that the scope of Aelia Capitolina, the city built by Hadrian after crushing the Bar Kochba Revolt in 135CE, was much larger than previously estimated. This kind of information about Aelia Capitolina can contribute greatly to research on Jerusalem because it was that city that determined the character and general appearance of ancient Jerusalem and the city that we recognize today. Take a tour of the Roman Gate and plaza, Struthion’s pool, Ecce Homo arch, the Cardo and secondary cardo to understand the Roman city. 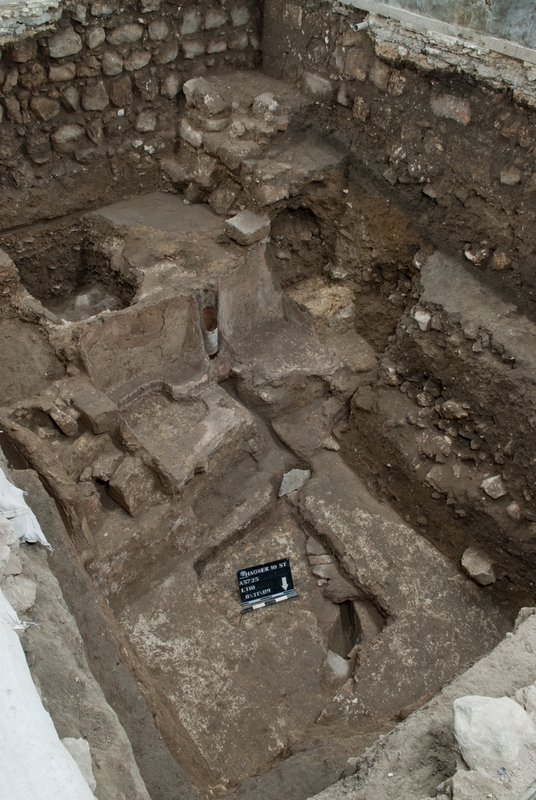 During the excavation we uncovered a number of plastered bathtubs in the side of the pool. Incorporated in the side of the pool is a pipe used to fill it with water and on the floor of the pool is a white industrial mosaic pavement. The bathhouse tiles, which are stamped with the symbols of the Tenth Legion “Fretensis” – LEG X FR, were found in situ and it seems that they were used to cover a rock-hewn water channel located at the bottom of the pool. The hundreds of terra cotta roof tiles that were found on the floors of the pool indicate it was a covered structure. The mark of the soldiers of the Tenth Legion, in the form of the stamped impressions on the roof tiles and the in situ mud bricks, bears witness to the fact that they were the builders of the structure. 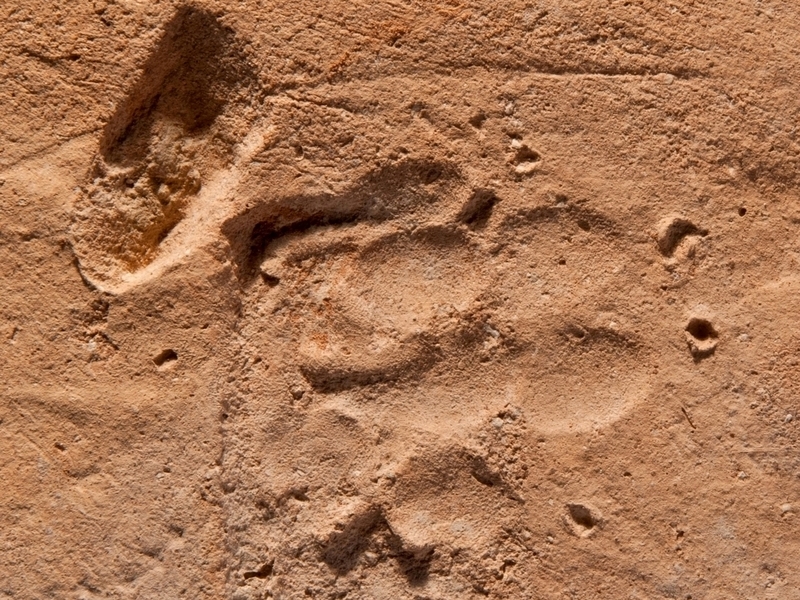 An additional discovery that caused excitement during the excavation was when one of the roof tiles was found with a paw print of a dog (that probably belonged to one of the soldiers) that obliterated the usual symbol of the legion – it could have happened accidentally or as a joke when the tile was being manufactured. Photos by Assaf Peretz, courtesy of Israel Antiquities Authority. This entry was posted in Archaeology, Jerusalem and tagged bath house, Jewish quarter, Legio X, Roman bath house, Roman bathhouse, Roman Tenth legion on November 22, 2010 by Shmuel Browns. Took a group to the site this afternoon, Nov. 23rd – they were pretty excited to see it when they learned it had just been reported yesterday. They have dug down about 3 meters below floor level inside a building. There’s a certain irony to uncovering a Roman bathing pool in the Jewish quarter while planning to build a mikve (ritual bath) almost 2000 years later.